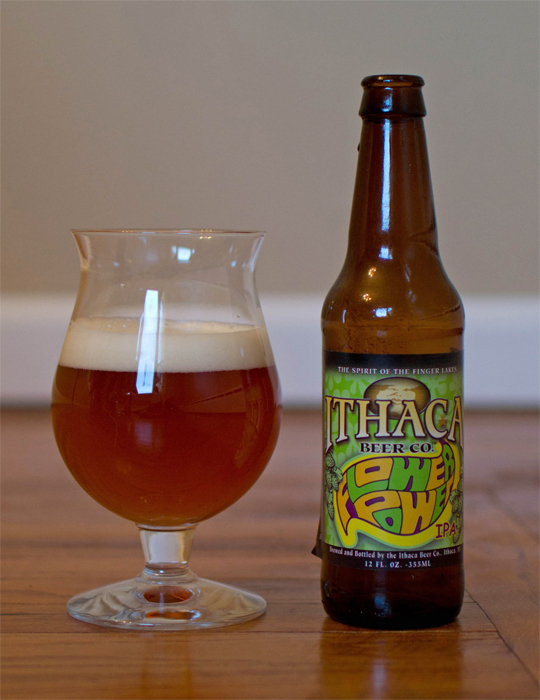 Beer #121 is Flower Power IPA by Ithaca Beer Company from the Empire State, New York. As you may have guessed, this is an American IPA with an ABV of 7.5%. What a nice pour this was, a nice frothy white head (awesome lacing also) topped this honey colored brew. As soon as I popped the top from the bottle, I knew I had a winner…the aroma from the bottle alone made my mouth water. The nose was excellent, lots of grapefruit, pineapple, pine, and a bit of bready malts. It tasted as good as it smelled with grapefruit & pine the biggest flavors. There was a nice sort of sweet malt thing going in here also but not as pronounced in the flavors as the hops. It finished on the bitter side and that bitterness lasted long after the sip was swallowed. The mouthfeel was nice, a medium bodied brew with some lively carbonation. It was high for me on the drinkability scale, but I prefer hoppy, bitter brews. This was a fine example of an American IPA. I have said it before and I will say again, I think American IPA’s are my favorite style of beer…yum!